Almost a year ago I started researching all the electric brewing system options that were available at the time and a few that were soon to be released. The Braumeister Electric All-Grain Brewing System looked like a quality product but there were a few things that I didn't like right off the bat. A 20 liter unit cost two thousand dollars, a bit too pricy for my budget, and the unit while very compact was imported and probably would cost a lot of money and downtime to have repaired. The unit's proprietary digital temperature readout was in centigrade only and the controller required a European 220 volt connector, I would have to hire an electrician to make the necessary changes to adapt to the North American 220 volt line I already had run. My hopes faded for buying the new Blichmann electric K-RIMS brewing system too, it was really nice but again a little to expensive for my budget. There were also several rounds of delays as the availability dates for the electric K-RIMS system kept getting pushed out, although it may be available now it's been over a month since I checked. 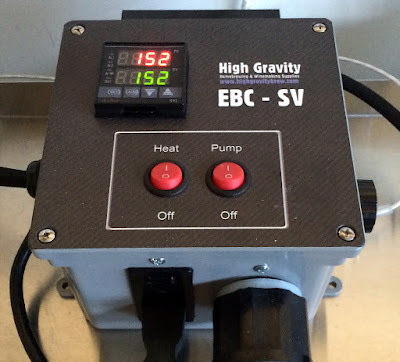 Finally I decided on the High Gravity BIAB Electric Brewing System from High Gravity Homebrewing And Winemaking in Tulsa, OK. I liked the price of this unit because it didn't wipe out my entire budget, I'd still have enough money left over to pay for the remaining items the brew room would need. The entire system shipped in a single Bayou Classic box and was delivered about two weeks after I ordered it. 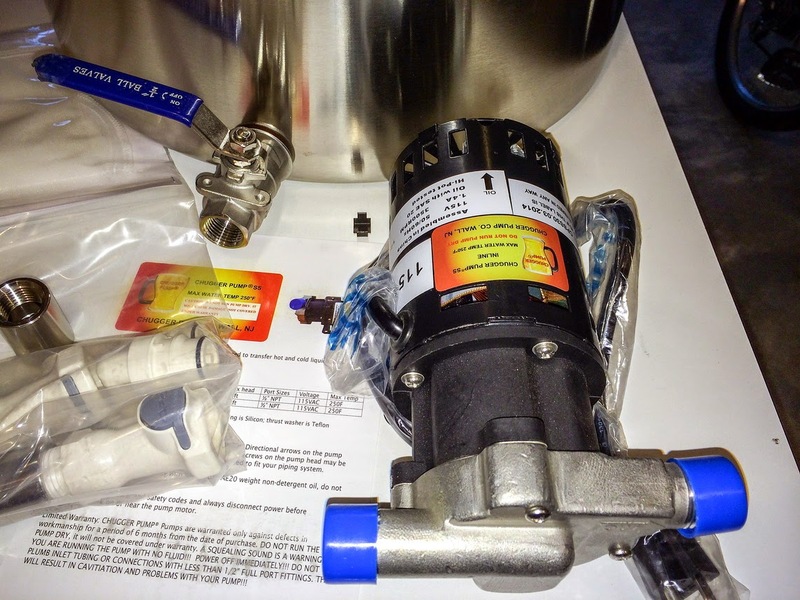 It's a very compact one kettle brewing system that came with a Chugger pump, the High Gravity custom built EBC-SV digital temperature controller and a stainless steel probe. Some assembly was required like screwing the heating element into the pre-drilled hole in the kettle, assembling the quick connects and stainless steel couplings and reorienting the stainless steel pump head to a vertical position. I bought the 62 quart version that uses a 220 volt 30 amp GFIC line to power a single 4500 watt ultra low watt density stainless steel heating element. The only upgraded option was substituting the half inch reinforced PVC with high temperature silicon tubing for a few extra dollars. Other than that everything needed to get the system up an running was included in the base price. Referring to the directions that came with the unit I screwed the fittings together and placed the kettle, pump and controller in a configuration that worked best and then cut the tubing to length as needed to connect them together. It's a good idea to fill the kettle half way with water and let it sit overnight to check for leaks when connecting the heating element. Use Teflon tape on all of the connections making sure to tighten them enough and then run a test batch of water through the pump and kettle to check every connection for leaks before brewday. 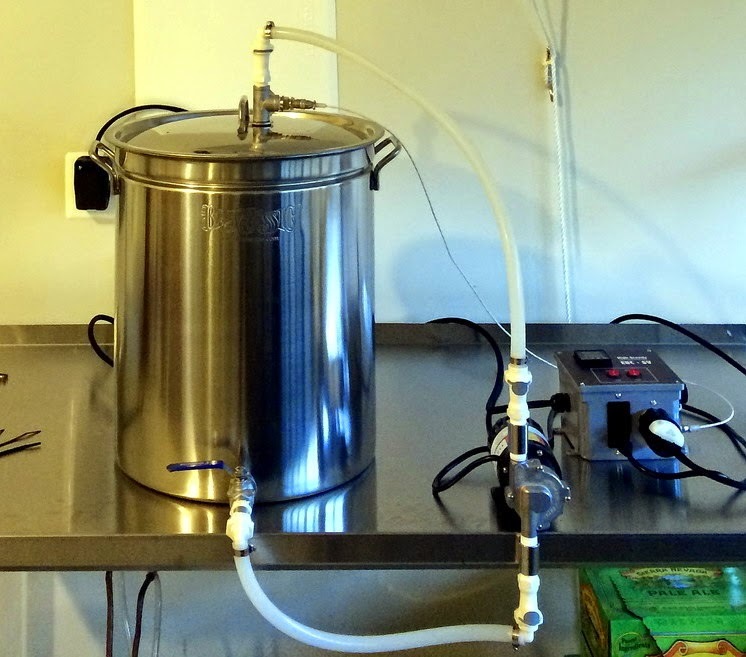 It wasn't too long after the electric BIAB system arrived that I started reading on home brewing forums like HomeBrewTalk and the BeerBorg just how awkward and challenging it was to lift the hot wort soaked grain bag out of the kettle to drain after the mash. The twenty pounds of dry grain in a recipe translated to sixty pounds when wet, which is way too much for a person to handle unassisted. 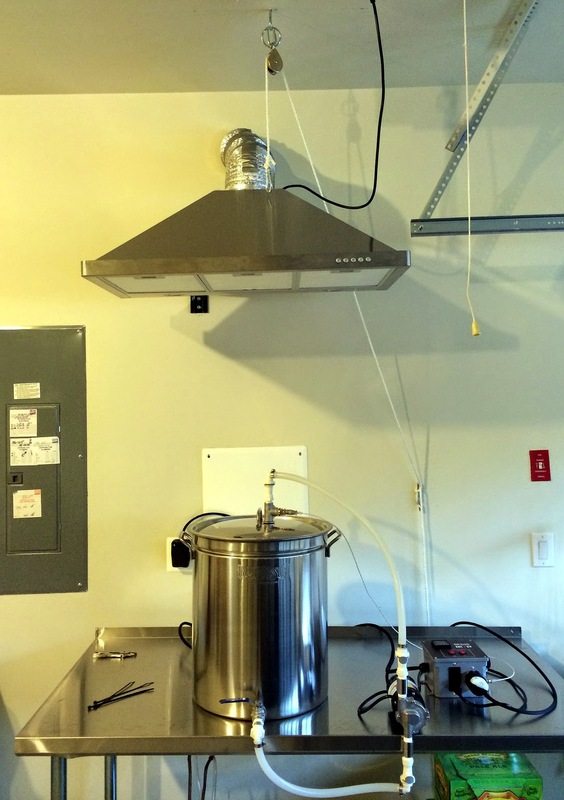 An indoor brew room also requires enough ventilation to remove about two gallons of boil vapors on a typical brewday to prevent the growth of mold and mildew. 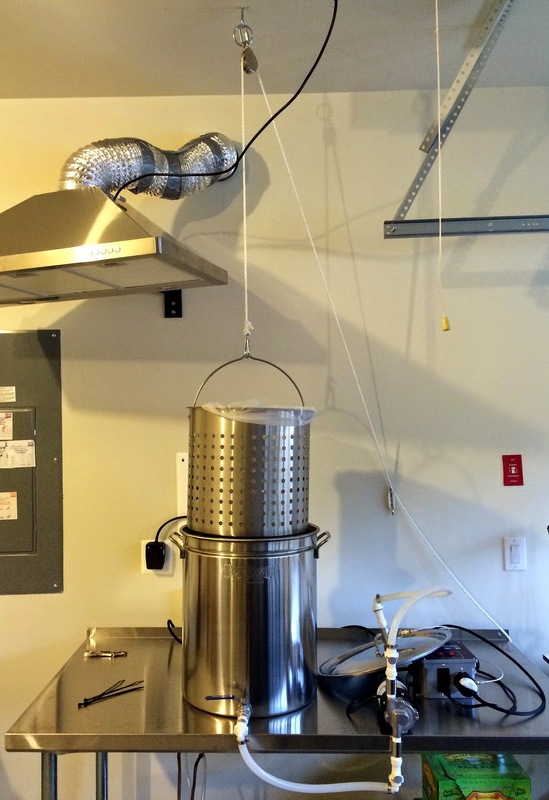 The best placement for the ventilation hood to remove the vapors, and an overhead pulley to help lift and hold the wet grain bag, is directly over the kettle. 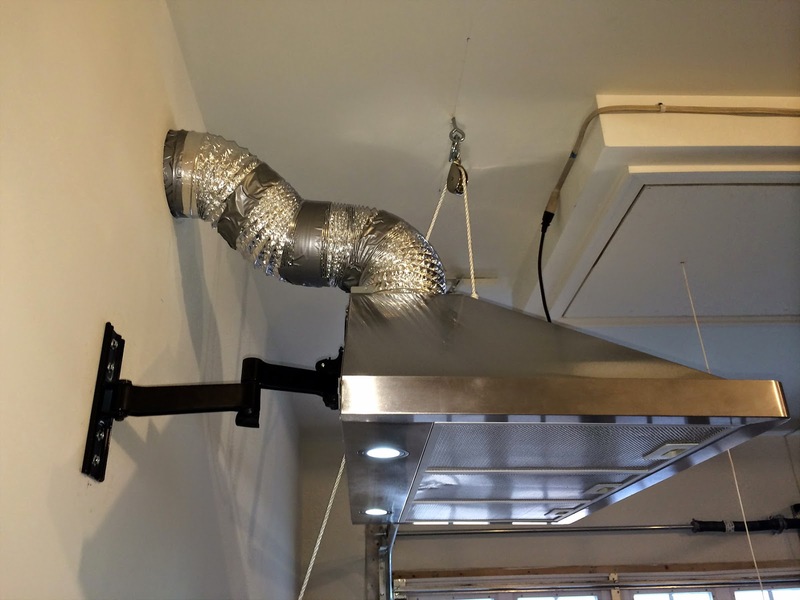 Clearly something had to give so I used an articulating, swivel and tilt TV wall mount to hang the ventilation hood and a flexible exhaust duct to connect the air discharge to the wall vent. Up until now I've seen and read a lot of different ways home brewers have come up with for lifting these hot, wet, heavy grain bags and to me mostly all of them are scarey. I've watched videos of folks hanging their grain bags to drain into their kettles from kitchen cabinet doors, two by fours held in both hands as they struggled to keep a tight grip and ladders rigged with rope and pulleys. To me the scariest method of all was lifting a basket full of wet grains by hand and then trying to tip the basket on an angle so it would sit on the top rim of the kettle without falling into the hot wort and making a splash. Clearly having a fixed pulley directly over the center of the kettle was the best way to go. A rope threaded through the pulley overhead, with a latched hook for the basket handle on one end, could then be used to safely lift the heavy grains out of the wort and the other end of the rope tied off to a wall cleat to hold the basket of grains up until they drained. Obviously the exhaust hood had to be mounted so that it could be moved out of the way in order to drop the grain hoist down and use it to lift the wet grains. After a little research for an affordable swivel mount I found one that met all the requirements for my installation, an articulated swivel and tilt TV wall mount capable of supporting up to sixty pounds was just what I needed. After a quick look in a couple of local big box appliance stores I was able to buy one and use it to mount the exhaust hood to the wall exactly how I had envisioned it. 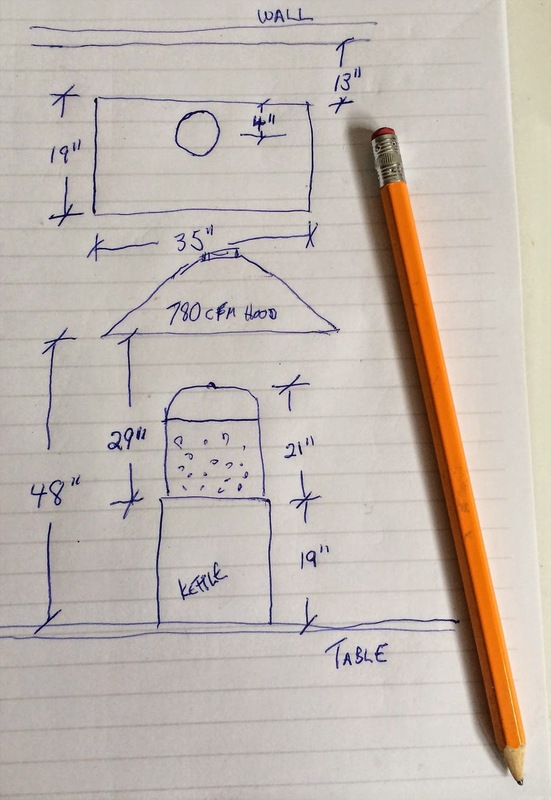 Since every good design begins with a scale drawing as the parts for the brew room were delivered I started taking measurements of the components and writing them down in a notebook. Once all the component dimensions were recorded on a rough sketch I created a detailed scale drawing showing plan, elevation and end views of the brewing area, table, kettle, basket, hoist and ventilation hood. The time that went into planning everything on paper this way before actually doing the installation was well worth the effort and actually saved time in the long run. Once everything started to look good on paper I was ready to take out the electric drill, bits, saw and start the installation. I used a three speed exhaust hood with a fan rated at 780 cfm that was capable of changing all the air in the brewroom once every eight minutes. For maximum performance the manufacturer recommended hanging the hood centered over the kettle with the bottom of the hood between 30 and 48 inches above the top of the kettle. The bottom of my exhaust hood ended up being closer to 30 inches from the top of the kettle, the smaller distance from the kettle will make exhausting the heat and boil vapors outside easier to do. There is also a formula for calculating the cfm size of the exhaust fan based on the number of watts the heating element is rated at. Where a 4500 watt heating element divided by 17.6 equals a 255 cfm fan size. But again the distance from the exhaust hood to the kettle and the location of the hood, whether it's wall mounted or free standing, will all weigh into the final calculations. The Chugger pump isn't self priming so the orientation of the pump head had to be changed to point the inlet down below the table top. You do this by removing the four screws that hold the stainless steel pump head onto the magnetic drive that is in turn mounted to the motor. Remove the four screws and turn the pump head a quarter turn until the inlet is pointing down, then securely tighten the four screws again. Doing this will allow liquid to drain from the kettle filling up the tubing leading to the pump inlet so the pump doesn't become air bound. It's a good idea to put a quarter inch silicone trivet or potholder underneath the kettle to prevent heat from kettle bottom from dissipating into the table top. A small piece of similar material bolted between the pump base and table will prevent noise transfer during operation although these pumps are very quite when the run. Now that all of the brewing hardware is in place it's time to start thinking about using the new BIAB brewing process. I've been a single infusion mash fly sparger ever since first moving to all grain brewing, now I'll have to adapt to the changes involved with brewing on an automated system. The Electric Brewery Controller - Single Vessel (EBC-SV) will take the work out of maintaining temperatures and in time with a little practice will be ideal for doing stepped mash recipes opening the door to a whole new world of brewing possibilities. The BIAB brewing process itself requires almost all of the brewing water to be added at the start of the mash, which makes for a pretty thin mash thickness. The thinner mash thickness during the mash, makes maintaining the correct pH range of the brewing water at the start, even more important. After all the prospect of brewing with the BIAB method instead of infusion mashing was what led me to research brewing water properties in the first place. Do you have pictures of your chiller? How does your chiller attach to your BIAB system/pump?